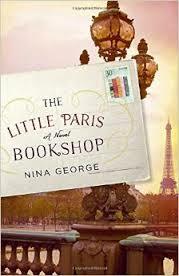 Even though M. Perdu has a job that sounds perfect, he's still pretty miserable in The Little Paris Bookshop. He runs an "apothecary bookstore" moored in the Seine in Paris. Visitors to the shop know that they might not leave with the book they came in for, but that M. Perdu will unerringly be able to recommend the book that they need at that precise moment in their lives. Unfortunately, he's not able to fix his own problems so easily. Twenty years ago, when he was 30, the great love of his life, Manon, left him with no explanation. He was totally broken by this experience -- so much so that when a letter arrived from her a few weeks later, he was unable even to open it. He put it in a drawer in a kitchen table, in a room which he then walled off with a bookcase. There matters have stood for two decades, until he's bullied into donating some furniture to a new tenant in his apartment building. The new tenant, Catherine, is a middle-aged woman who has been abandoned by her husband, and is terribly distraught. When she discovers the letter in the drawer of the table M. Perdu gives her, she invites him over for dinner to read it. These two broken souls might be just what the other needs, but M. Perdu can't give up on his heartbreak just yet. Another tenant in the building is Max Jordan, a young man who's just found literary success with his first novel. However, he finds the rabid, enthusiastic fans hard to take, so he's trying to hide out while he waits for inspiration to strike so he can begin on his follow-up novel. When M. Perdu decides to unhook his literary barge and set off in search of his long-lost love, Max impulsively jumps on board for the journey. And so they begin a journey toward the south. Along the way, they pick up more people who are searching for lost loves (among other things). Scattered throughout the book are selections from Manon's travel diary from 20 years earlier. Also, the end of the book features recipes and a suggested "Emergency Literary Pharmacy" recommending books for various "ailments." The book starts off strongly, but then meanders along aimlessly, much like the characters on board the barge. I had a hard time accepting that everyone could just pick up and leave their current lives, with no thought of how they would support themselves, and then immediately, wherever they ended up, just miraculously be taken in and given food, shelter and jobs by the people they randomly encounter. The whole book, from about chapter 5 on, was a huge let-down for a promising book. The characters were all so woe-is-me that I really didn't care if they were ever happy again.